Glyndwr Welsh Terrier Club | All Welsh Terriers Welcome!! 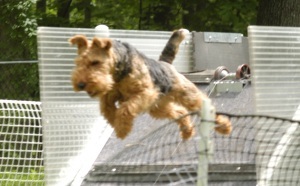 The Glyndwr Welsh Terrier Club is a social group that shares fun with our Welsh Terriers. We were formed in 1977 and are made up mostly of pet owners, but we have a number of members who are involved in the show world. The bulk of our members live in Connecticut, New York and New Jersey, but we have others as faraway as Wisconsin and Maine. We get together several times a year for fun events, including walks in the Spring and Fall, a BBQ, an Earthdog Dig and our main event … an all day Fun Day. Naturally … we bring our Welshies to ALL our events! We publish a quarterly newsletter for our members … the Glyndwr Welsh Times. It includes articles and pictures on a wide variety of topics, from funny to serious, plus pieces contributed by our members. Most importantly, we are a resource to our members. Got a problem with your Welsh … have a question about behavior … want to talk about health issues … Glyndwr provides a network of members instantly available to help. If you belong to Glyndwr … you’re never alone out there! We also use our extensive member network to help Welshies in trouble by helping to find them good homes. In addition to our extensive membership network, we coordinate our efforts with other breed rescue organizations. Come explore our website and learn who we are and what we do. GWTC has recently lost one of our founders, Bardi McLennan – read more about this fascinating person!